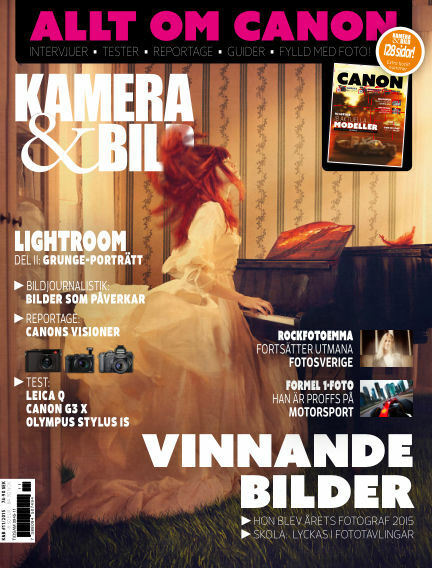 In this issue of Kamera & Bild : Ny tidning ute nu – med CANON-SPECIAL! Totalt 128 sidor: SKOLOR: Coola porträtt i Lightroom, Så tar du vinnande bilder & Lag och rätt för fotografen. TESTER: Leica Q, Canon G3 X & Olympus Stylus 1S. INTERVJUER: Emma Svensson, LisaLove Bäckman & Frits van Eldik. GRAND PRIX: Årets Fotograf korad. 51 SIDOR CANON-SPECIAL i tidningen med massor av inspiration, tips, trix & guider – och mycket, mycket mer! With Readly you can read Kamera & Bild (issue 2015-11-03) and thousands of other magazines on your tablet and smartphone. Get access to all with just one subscription. New releases and back issues – all included.